If you were guiding a young person, making a list of things not to plan doing for a livelihood, writing poetry would be somewhere near the top. So, poets must think out of the box and in doing so, take it to the streets. There are many benefits to taking your writing to the sidewalks of New York City – no persuading agents of the merit of your work, you receive 100% of the proceeds and payment is immediate. And often, skills and arts honed on the streets for an audience of passersby who are cynical and jaded, will fare well in a more conventional venue. Many well known performers have worked the streets early in their careers. Their material is the product of sifting out the unsuccessful material, leaving that which grabs and holds an audience, frequently with many other options. Allan Andre hails from New York City. Online searches, however, find him plying his trade in other locales including San Francisco. See his website here. 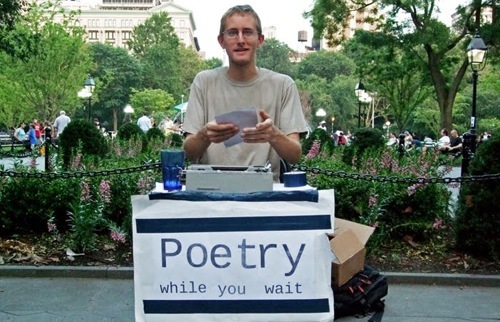 I met him in Washington Square Park and offered the subject “indecision.” Only some minutes later, typing away on a manual typewriter with a carbon copy, he offered me his poem. I made a contribution. See the text of my poem here. As a computer science and economics student who no doubt will get a technical job when I finish studying, I really stand in awe of creative people like Allan who can literally create art out of nothing but a simple concept or idea. My late mum was very much like that too. It takes a special kind of person to create art, and heaven knows I'm not one of them! How do poets, and writers, and painters, and sculptors, and designers do it? Don't look at me for answers! I know if I ever find myself in New York or San Francisco I'll be looking for Allan and the Poetry While You Wait folks! Think they could write me a poem about why Objective-C is better than C++?